Released about a year after Piece of Cake, this EP collects a group of seven disparate tracks that actually make for a nice little album. I'm just now realizing that this whole thing has been tacked onto the deluxe version of Piece of Cake, which I have yet to purchase and probably won't. So there you go. 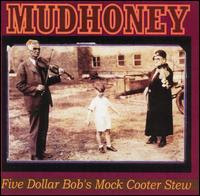 If nothing else, this album features Mudhoney's worst (or best?) album title and cover art, taking a left-field approach that they wouldn't really ever come close to again. I don't really care for it, but that's just my opinion. The songs here, like I said, are a mixed bag. "No Song III" is the most single-ready of the group, with the band using guitar tones that almost echo the ones used on their previous record, but the whole thing sounds popped-up a bit. I think it's a pretty cool track. "In the Blood" sounds like a nice mix of old and new Mudhoney, with the darkness of their oft-used organ making a sweet appearance. "Between Me & You Kid" would have made a nice partner to "Blinding Sun," though it's much more twangy than anything the band had done up to this point. "Six Two One" sounds like a leftover from Piece of Cake, and it's a solid track. "Make It Now Again" is a rerecording of "Make It Now" from their previous effort, and I'd like to know the story behind why the redid it. Anyone? So, those tracks were all recorded in one burst, and the final two tracks are pulled from a 1992 recording session, apparently, and you can tell. They sound different, both in the recording and the feel of the tracks. You can sort of see why they weren't deemed album-ready, but they're good songs nonetheless. I hadn't heard this thing in a long time, and I recently picked up a used copy on CD. I'm happy to have it.